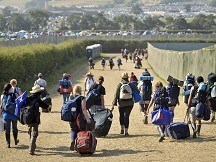 Wellies and waterproofs were essential attire as the first of more than 170,000 ticket-holders arrived at Worthy Farm. Organisers moved to reassure arrivals by tweeting on Tuesday night that "things are looking good in Pilton" with "dry, green grass and sunshine". But Matthew Dobson, a forecaster with MeteoGroup, the Press Association's weather division, delivered a less optimistic assessment, predicting "heavy downpours in the afternoon, accompanied by blustery winds and even a crack of thunder". With gates opening at 8am, a steady stream of 60,000 campers are expected to arrive throughout the day in a bid to get top spots for their tents. The weather remains unsettled over the following days before headline acts U2, Coldplay and Beyonce take to the stage on Friday, Saturday and Sunday. Michael Eavis believes this year's Glastonbury "moment" could be a tomato fight. The festival founder revealed his pride and joy is a new medieval bullring - Campo Pequeno. The 75-year-old farmer said the arena is "my real baby this year". Among a host of theatrical events at the site will be Glastonbury's own version of La Tomatina. Mr Eavis added: "Campo Pequeno - fantastic. Building the thing now, seeing it all come together with everyone around. That's the best bit for me." Other new elements for this year include The Spirit of 71 stage, with acts that played at the festival 40 years ago.